I have struggled for years with my Yorkshire Puddings! They either came out of the oven like hockey pucks or burnt on the outside but were wet inside. My best friend, Su, makes the most amazing Yorkshire puddings and was kind enough to share her family recipe but even that failed me. I eventually stumbled across this little gem and was shocked at how brilliantly it works! b. allowing the batter to rest for at least 30 min but ideally longer. 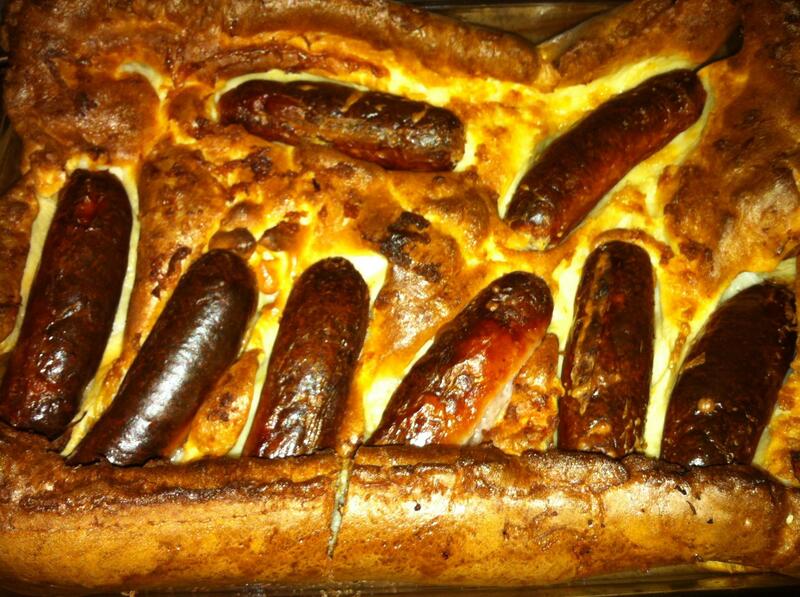 It also makes the most amazing Toad in the Hole! Yes, that really did taste as good as it looks! Preheat the oven to at least 200C. Put a little fat into each well of a muffin tray and put in the oven. Place the flour and salt in a mixing bowl. Make a well in the middle. Gradually add all the milk, whisking to ensure there are no lumps in the batter. This is quite a runny mixture, similar in consistency to double cream. Leave the batter for at least 30 min to rest. This seems to be the key to the success of this recipe. When the batter rested and the fat is smoking hot, add the batter to each well. I found it easier to pour the batter from a jug rather than trying to ladle the batter into the hot fat. Bake in the own until well risen and golden brown, about 20-30 mins. As you can see from the photos this recipe really does work well. Thank you! I genuinely have struggled with them for years! I was so shocked when it worked!